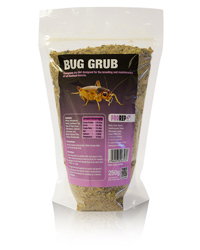 ProRep Bug Grub is a complete dry diet, high in calcium and protein, designed for the breeding and maintenance of all livefood insects. It is made from the highest quality ingredients to ensure maximum palatability. This is a 250g refill for the Bug Grub plastic Tubs. Directions: Place Bug Grub in a shallow dish and place in the feeder insects enclosure, ensuring that the insects can get to it. Only feed enough Bug Grub each time to last 1 or 2 days. Provide fresh food regularly as mould will grow if Bug Grub gets wet. Bug Gel and/or small pieces of Carrot should always be provided as a source of moisture. Precautions: Not for human consumption. Wash hands after use. Do not inhale dust. Contents: Protein 16%, Oil B 4.5%, Fibre 17.2%, Ash 11%, Moisture 13.8%, Magnesium 0.3%, Vitamin A5000iu/kg, Vitamin D3 500iu/kg, Vitamin E 20iu/kg, Selenium 0.05mg/kg, Copper 30mg/kg.